My historical research found that women's bands existed from 1870s through the 1970s. 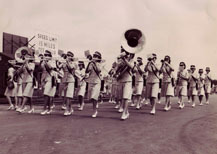 Particularly interesting was that women's military bands were formed during World War II as part of the first women's military organizations: WAC (Army), SPARs (Coast Guard), WAVES (Navy), MCWR (Marine Corps Women's Reserve). I recently published a book on this topic, "Bands of Sisters" with Scarecrow Press. In addition, I am currently writing an article on this topic that examines the contributions of seven women music teachers who served as conductors of these bands. I am pleased to report other original findings. Women formed bands during the nineteenth and twentieth centuries like men, such as family bands, town bands, professional touring bands, suffrage bands, high school bands, normal school bands, university bands, immigrant bands, and military bands. Early twentienth century women's town bands were common, such as the brass ensemble pictured on the right from Keota, Iowa (1915). My research now includes more than a century of women's bands. These research findings are original and have not been reported or investigated until now in the field of music education, music history, or American history. ASU graduate students in music education have furthered this line of research by investigating and writing on topics found in my research. Now their original research, they are currently investigating or have written on the following women's bands: the Canadian WAC Bands, the Hormel Girls, the Women's Air Force Band, and the 14th Army Band. Additionally, ASU doctoral students are researching and writing on the following historical topics: music education in America's public normal schools; music education in the one-room schools of Maryland; the history of the San Diego High School Alumni Choir.